Early monitoring of these discrete analog audio paths was often a simple go/no-go, with basic checks of level and phase during production, in master control and possibly at the transmitter site as well. As facilities moved toward multichannel operation and digital infrastructure, audio monitoring initially remained largely unchanged-with the exception that it was now frequently being done in the digital domain and integrated with the video monitoring. 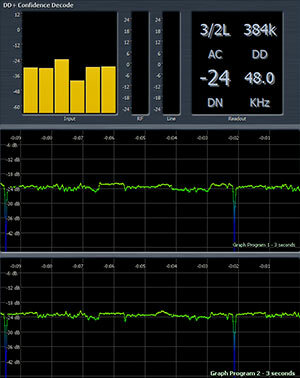 With the development of standards, such as EBU R128 and ATSC A/85, measuring and controlling loudness (as opposed to simply program level) throughout the entire program chain became far more critical. Products began to hit the market to address these issues, but (while effectively meeting the requirements) they for the most part were "bolt on" solutions of some sort, not truly aware of or integrated with the rest of the facility. As technology developments continued, tools for meeting these standards were increasingly integrated into more equipment in the chain, but these components still, for the most part, remained largely unaware of the other parts in the system. The current transition underway in the broadcast facility is from SDI and AES to IP-based signal distribution-including AES67 Audio over IP (AoIP). This presents a unique opportunity to bring all production, routing, distribution, processing and monitoring onto a common platform where every piece of the chain can be fully integrated and aware of the others. Through an AoIP network, any point in the system can not only send audio to and from another point, but also process, encode, decode, meter and monitor the audio at those points. Your facility is no longer limited to the capabilities of the patch bays, crosspoint routers and DA frames (or the equipment connected to them). Effectively the IP network and applications running on systems connected to it can largely take the place of that infrastructure, offering nearly infinite flexibility and expandability, particularly when it comes to signal monitoring. One example of this would be migrating from dedicated hardware loudness management and metering to software-based platforms. With the traditional hardware-based model, each signal path would typically have an audio processor and/or loudness meter inserted at some point in the chain using SDI or AES I/O. This approach quickly becomes less efficient as more signals are added and need to be processed or monitored. In a software-based model, the audio is carried to and from a server platform on the AoIP network as AES67 compliant streams. These streams could be generated by dedicated hardware endpoints that convert to/from SDI, AES, analog or MADI (for example). They could also originate from any other piece of equipment capable of natively generating and receiving AES67 compliant audio streams. A common server platform can handle monitoring, processing, encoding and decoding multiple streams of audio from the AoIP network, up to the limitations of the hardware. This creates a much more scalable and flexible environment than the single box, single stream, single purpose approach that is extensible from production and ingest all the way through transmission. As you look toward equipment replacement and upgrades in your facility, it makes sense to evaluate solutions that incorporate standards-based signal distribution over IP such as AES67, bearing in mind that building a robust IP infrastructure allows for implementation of future standards, as well as a migration path from existing infrastructure. IP signal distribution isn't the future-it's here.